To “peregrinate” means to wander. These birds are found all over the world and birds from the arctic tundra regularly migrate to the southern end of South America and Africa. Other names: Duck hawk, great-footed hawk, Peale’s falcon, rock falcon, wandering falcon. Hunting habits: One of its favorite foods seems to be domestic pigeons. Also takes other birds from the size of ducks and herons to small songbirds. Occasionally takes mammals, insects, and even fishes. 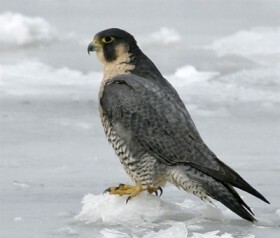 The Peregrine often captures prey by performing spectacular vertical dives (stoops) from high altitudes. During these stoops the birds travel well over 100 miles per hour! Nesting habits: Over much of its range scrapes a hollow on a cliff ledge; takes abandoned eagle, hawk, or raven nest in arctic. Each egg takes 28-29 days to hatch, and the young make their first flight when 5 or 6 weeks old. In recent years many Peregrines have been successfully re-introduced to former breeding areas. They now are found nesting on tall buildings or other man-made structures in several large cities. Weight: Males average 581 grams, females 817 grams. In the world of raptors, females are bigger, stronger, and usually more aggressive than males. Life expectancy: Wild ones have lived to at least 12 years, 3 months.